Deep sea fishing for dolphin (mahi mahi) has been great this month and looks to be getting better. April 11th 2016 – Some winds are prevailing here for the Key West fishing report this week. The Key West Final Sail, sail fishing championship is this week from April 12-17. Good week for it too with some of the best sail fishing in the deep sea report we have seen yet this year. 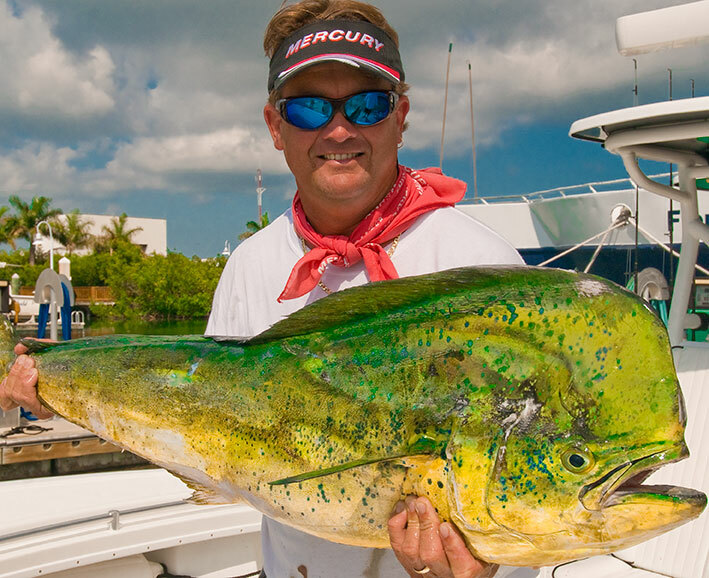 The blue water deep sea fishing report for Key West is full of fun fishing. The last little cold from we got brought some easterly winds brining the sailfish down the East coast to jam up our reef line for some hot exciting action. Capt. Brice Barr went 16 for 20 yesterday on the full day Sunday. For dolphin (mahi mahi) it doesn’t take a long trip offshore to find some large dolphin running through the deep. Reports of dolphin in the 20 – 45 lb range are being turned in daily up and down the Florida Keys and Key West. To all of that, add some tuna and wahoo to the fishing report and get a really fun day with a nice colorful box cooler for dinner tonight. Availability is good for deep sea fishing till the Shell Tournament that runs April 21st through 24th and takes up 100% of the Key West deep sea fishing fleet. We will personally help you put together a fun day on the water.